The anti-immigrant populism brings passion back into politics, it speaks in the terms of antagonisms, of Us against Them, and one of the signs of the confusion of what remains of the Left is the idea that one should take this passionate approach from the Right: “If Marine le Pen can do it, why we should also not do it?” So one should return to strong Nation-State and mobilize national passions… a ridiculous struggle, lost in advance. So what does Europe want? Basically, Europe is caught into a vicious cycle, oscillating between the Bruxelles technocracy unable to drag it out of inertia, and the popular rage against this inertia, a rage appropriated by new more radical Leftist movements but primarily by Rightist populism. Is this paradox not confirmed by a quick look at the conflicts between the UK and the EU in the past decades? When they concerned workers’ rights, it was the EU which demanded limiting the weekly work hours, etc., and the UK government complained that such a measure will affect the competitiveness of the British industry… In short, the so much vilified “Brussels bureaucracy” was also a protector of minimal workers’ rights – in exactly the same way as it is today the protector of the rights of the refugees against many “sovereign” nation-states which are not ready to receive them. When Stalin was asked in the late 1920s which deviation is worse, the Right one or the Leftist one, he snapped back: “They are both worse!” Was it not the same with the choice British voters were confronting? Remain was “worse” since it meant persisting in the inertia that keeps Europe mired down. Exit was “worse” since it made changing nothing look desirable. In the days before the referendum, there was a pseudo-deep thought circulating in our media: “whatever the result, EU will never be the same, it will be irreparably damaged.” However, it’s the opposite which is true: nothing really changed, just the inertia of Europe became impossible to ignore. Europe will again lose time in long negotiations among the EU members which will continue to make any large-scale political project unfeasible. This is what those who oppose Brexit didn’t see: shocked, they now complain about the “irrationality” of the Brexit voters, ignoring the desperate need for change that the vote made palpable. For this reason, one should fully support the EU stance that the UK withdrawal should be enacted as fast as possible, without any long preliminary consultations. Understandably, the Brexit partisans in the UK now want have a cake and eat it (or, as a commentator viciously remarked, they want a divorce which will still allow them to share the marital bed). They desperately want to strike a middle road (Boris Johnson’s proposal that the UK should maintain free access to the common market was quite appropriately dismissed as a pipe dream). Recall Mao Ze Dong’s old motto: “Everything under heaven is in utter chaos; the situation is excellent.” A crisis is to be taken seriously, without illusions, but also as a chance to be fully exploited. Although crises are painful and dangerous, they are the terrain on which battles have to be waged and won. Is there not a struggle also in heaven, is the heaven also not divided – and does the ongoing confusion not offer a unique chance to react to the need for a radical change in a more appropriate way, with a project that will break the vicious cycle of EU technocracy and nationalist populism? The true division of our heaven is not between anemic technocracy and nationalist passions, but between their vicious cycle and a new pan-European project which will addresses the true challenges that humanity confronts today. 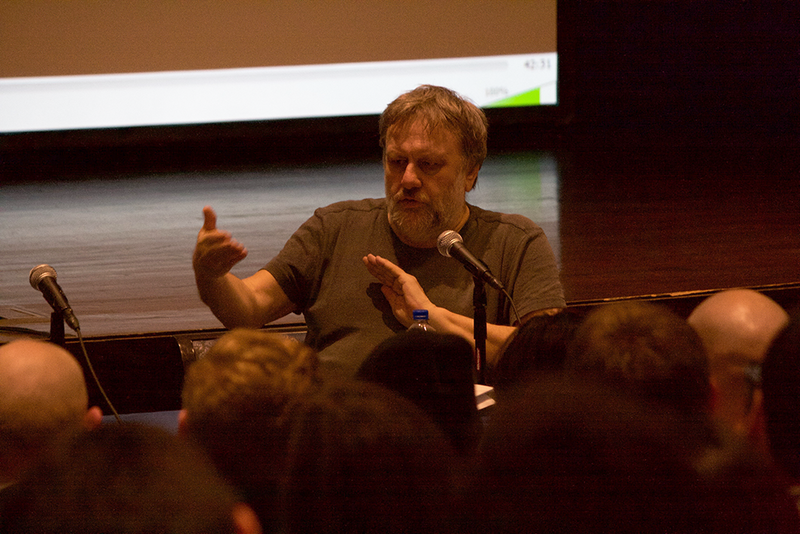 Co-founder of the Slovenian Liberal Democratic Party and prominent intellectual Slavoj Žižek spoke at Pomona College's Rose Hill Theatre on Tuesday, Feb. 28. Žižek, a follower of Hegelian philosophy, is known for his theoretical combination of philosophy and psychoanalysis, and his ability to apply dense academic theory to pop culture and modern-day politics. Žižek’s talk focused on how the process of producing something can result in a “surplus-enjoyment,” an idea which can be applied not just to the production of material things, but to psychological processes. At one point, Žižek compared the functioning of ideology in our everyday lives to the augmented reality game Pokémon GO. 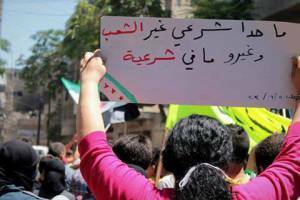 Once more the Syrian revolutionary process is betrayed by a figure of the International left. The article of philosopher Slavoj Zizek published in the Guardian on September 6 2013, entitled Syria is a pseudo-struggle (http://www.theguardian.com/commentisfree/2013/sep/06/syria-pseudo-struggle-egypt) was unknown to me until very recently, actually yesterday. As this article came out from an important figure of the International left, I believe it is necessary to answer and contradict them and for others also on the left to show that this is not an opinion shared by all comrades. This is why I will deconstruct the article of Slavoj Zizek and demonstrates not only his wrong analysis and information on the Syrian revolution but his elitism as well. Firstly, I think the use of allegedly, even in brackets, is misdirecting, not to say anything else, because we can say now with certainty that most of the research have proven that it is the Syrian regime that attacked with chemical weapons and toxic gas the region of Eastern Ghouta, a suburb of Damascus, on August 21, 2013 killing more than a thousand people including a large number of women and children. Medecins Sans Frontieres issued a statement saying that hospitals it supports in Syria treated about 3,600 patients with “neurotoxic symptoms”, of whom 355 have died. It said the patients had arrived in three hospitals in the Damascus governorate on 21 August – when opposition activists say chemical attacks were launched against rebels. This statement provided more evidence of chemical weapons use.